VETERINARY ACUPUNCTURE: Needles, Herbals and holistics, Oh My! Why veterinary acupuncture is not as scary as some owners may fear. Needles are painful, right?! Well, the long and the short of it is, no. When used in the context of acupuncture, the result can be relief. Surprised? Well, animals don't lie and they can’t hold a poker face. lay down and anxiety melts away. and cells to initiate healing. activity to decrease pain and/or restore basic body functions. system that regulates all bodily activities). What can’t it treat might be the shorter answer! Used by traditional Chinese veterinary medical practitioners for over 3,000 years, the practice is well honed. Acupuncture seeks to correct the underlying imbalance. Old dog? Acupuncture is great for arthritis. Separation anxiety? Acupuncture may be the only real treatment option. Diabetes? Absolutely acupuncture helps. Herniated disk/ general pain? Incredible results, without the side effects. What can I expect? Your veterinary acupuncturist will first want a detailed history. I take this time to acquaint myself with the animal, time to get a feel for the animal’s demeanor (“constitution” in traditional Chinese medical terms). I check for local trigger points, if it is a horse, I used a needle cap to scan for diagnostic points. A good acupuncturist will always look at the tongue and feel for pulses. This gives additional information about the disease state/ imbalances occurring internally. From the history and exam, the acupuncturist chooses points to best elicit healing from the 2 animal. How long the problem has been going on is a good indicator of how many sessions will be needed to see results. 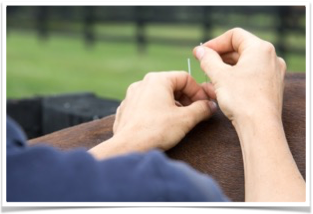 Acupuncture has no side effects and is extremely safe in the hands of a certified veterinary acupuncturist. There are so many instances where conventional medicine fails to treat our animals adequately. Over-medication instigates a cascade of unwanted symptoms and ultimately our animals suffer. Acupuncture uses the animal’s own body for healing. And that is the best medicine of all.